Well the wind and the rain is here but so are some fish! There has been good fishing for winter chinook in the harbour this past week. There have been fish along W. Van on the flood and there has been fish off the Mile Markers and Bell Buoy on the flood and the ebb. Howe Sound continues to produce some fish, but classic winter chinook fishing, hot one day and cold the next. If you are in the right spot at the right time, the fish are getting big! We have seen some fish in the 10 to 20 pound range this week. The top baits haven’t changed much. Pesca Spoons and Kingfisher Spoons that have some glow and some green in them are all working well. Much the same can be said about flasher colour choice. If it has glow tape on one side and some green it, well you are probably on the right track. 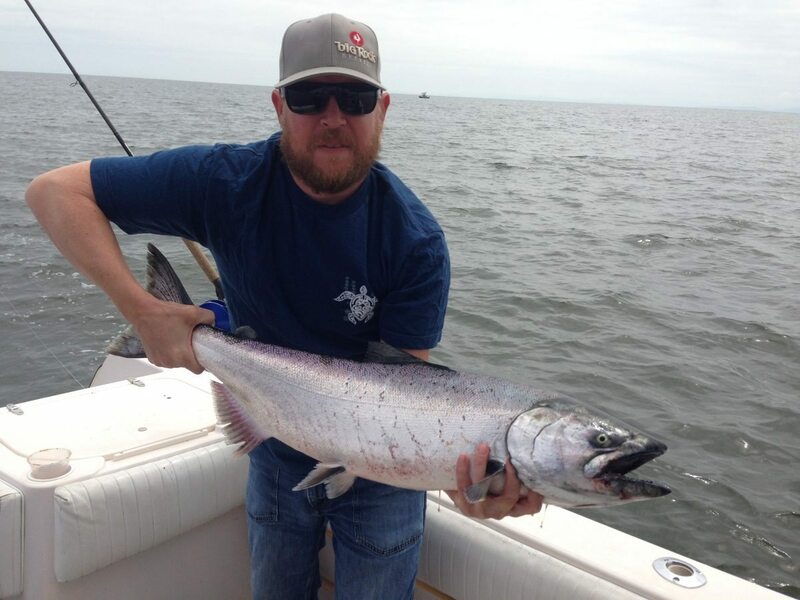 Remember these are about as aggressive a chinook salmon as you will ever fish for, so tackle choice is important, but not nearly as much as certain other fisheries. Fish what you have confidence in, troll fast so you cover lots of water, keep your gear close to the bottom, look for bait, and let the fish do the rest. It looks like these nasty winds from Thursday and Friday are going to back off by Friday night and we will have SE winds over the weekend for the most part. You guessed it, lots of rain as well. If you can handle the rain, the SE winds shouldn’t be too bad in the harbour and it should be fairly calm up Howe Sound as well. You might want to go check your boat out after the winds on Wednesday night, it was cranking hard and I am sure lots of boats were bouncing around all night Wednesday. We are looking forward, the fishing off S. Bowen will likely pick up right on schedule around mid April. 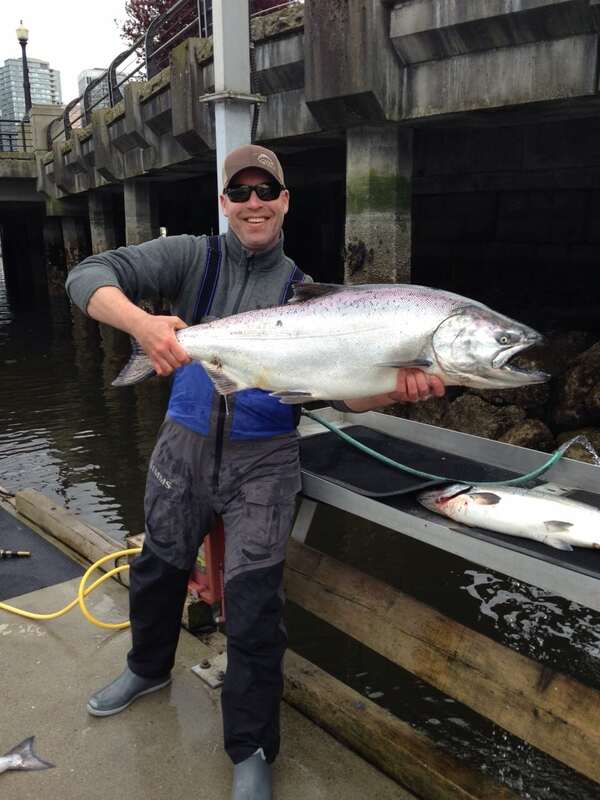 Last year was awesome and we had good catches of chinook starting as early as April 10. That is less than a month away! So time to get the boat ready and get your tackle up to snuff for the first big wave of chinook salmon. There were some brutes caught last year off S. Bowen at “The Hump” including this 30 pounder we caught on a charter. So make sure have fresh leaders and fresh mainline! If you would like to book a charter for winter chinook or later in April on “The Hump”, give us a call as April dates are filling up fast.